The recent Supreme Court ruling on contracts of employment has opened a floodgate of employment contract terminations. The effects were bound to reach the telecoms operators that have been operating in a tough environment. One of the letters that was allegedly sent to an Econet employee has been circulating on social media. It is termed as a termination of employment rather than a dismissal. Inspired to change your world. Sorry boss but at least you had a few years of a high salary. Bt this wont solve the main problem of most zim companies inefficienct and mis management. Plus upper management whats to stop the board from fiting you in the same way wht goes around comes aroung. Magaya achtemwa neyake inobva kuna Mboweni na strive. This letter is a carbon copy of the TN letter. Also doing rounds on social media. Having said that. Companies fire people all the time. You’re absolutely out of touch of current events. 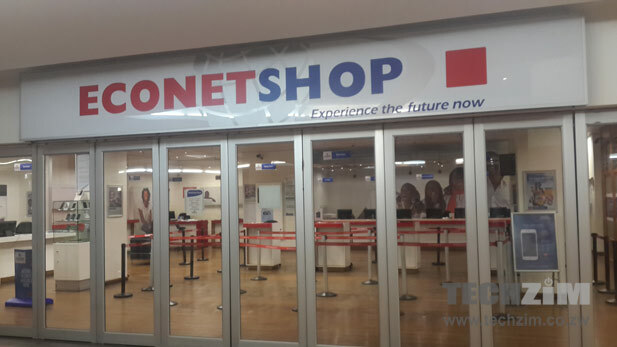 I just want to point out that this action by Econet is an unethical conduct. You cannot exploit a loophole in the law to render so many people jobless. Of course there were better alternatives even if it meant further reducing salary. All these affected people should fight until their cases are revisited. Inspired to Change your World sies!!! True bt televos is about innovation nowthose left even in top positions arent motivated as no reward is offered. Econet may use it to cull bloating bt lets fave it the blowback is huge as a person adopts a i dont care attitude since loyalty isnt rewarde. Prisca Mupfimira need to correct this as soon as possible. I think you are right. If lay-offs are entirely performance based, then employees are motivated to work harder (albeit, out of fear rather than enthusiasm). However, if employee lay offs are tied to position or the criterion is hazy, then fear gets in the way of work and some employees might decide ‘kudya pavakasungirirwa’ in case their dismissal letter is already in the mail. Who would want to go the extra mile, slave for a company for 20 years at a job where the end result might actually be the same as another person who got employed a year ago? It is true and logical that the monthly salary is compensation enough for work carried out irrespective of how many years we are talking about. But cold hard logic has never managed to buy loyalty. ahahhaha econet is taking its anger to poor zimbos…but u strive can’t u see u not doing anything but killing innocent souls..u know the main problem. .
Thats econect for you bully and uncaring, they will now wish another supreme court rulling to ban infrastructure sharing. This to me sounds like retrenchments ,doesnt the Labour act say anything about retrenching more than 5 people within six months ?Is this not a violation of Human Rights,most companies are legal beings but are not Humans,What is more important to us as a Nation?Shouldnt our legal system apply consideration even if the Law is clear? Doesnt presedence create Law ? This judgement interpreted Law but did not usher in new Law as some people think.I think the Supreme court judges should have made consideration on what this Law would have had on the employees,maybe in passing jugdement they should have added a statement to say that in giving notice the employer first apply measures to avoid terminations and should terminate where there is no reasonable expectation of continued engagement .The Labour Act is clear on that as well.Allowing companies to use this Law without taking into account other rights is opening the judgement to abuse.Can the Labour experts and Human rights associations take this to the Courts again and stop this rot.While this can be used for non performing employees it does not make sense to apply it on 400 people at once ,surely in that lot there is at least someone who is an excellent performer and in conclusion, a Fish rots from the Head and if companies are not performing then start looking at the heads first. Something has to give for the change that everybody desires to happen. Seems to me labour is not willing to give anything. Employers owe salaries for no work done coz of no sales, no production. That has its limits and I am sure we have reached that limit. 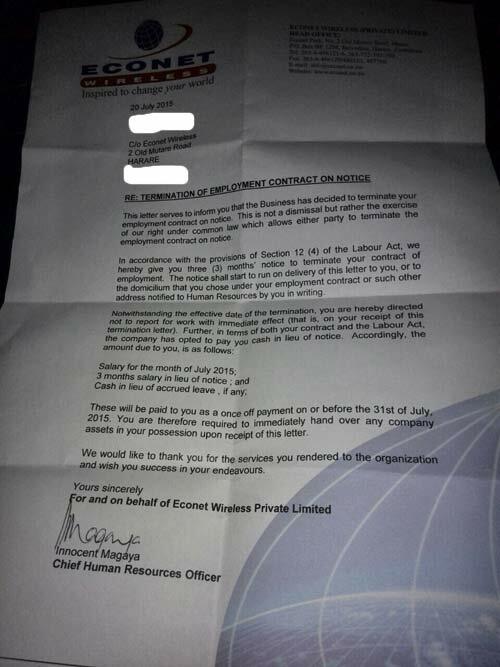 Unless this letter has been doctor’d i’d think EW are in breach of the labour act (http://www.osall.org.za/docs/2011/03/Zimbabwe_Labour_Act_Chap28_01.pdf). The act in my opinion empowers the employee and doesn’t give the employer much room or grounds to dismiss an employee at will especially without citing Employment Code which i believe a company such as EW would have. For anyone interested take a good read of the section titled “Dismissal” (section 12B ~ page 22). How about we make a go for this Magaya chap and all those dismissing workers? Make the Earth a hell for them, hound them wherever they are; be it at church, braai, lodge, funeral, beer hall, etc. Only just noticed this now – dear Techzim, WHO THE HELL IS “STAFF WRITER”!!!?? ?